Ryan “The Bench Monster” Kennelly faces criminal charges in two separate but related cases involving anabolic steroids. In October 2010, Kennelly was arrested and charged with “manufacturing marijuana and possession with intent to deliver marijuana and anabolic steroids” in Grant County. In December 2010, Kennelly was arrested and charged with “possession with intent to manufacture or deliver anabolic steroids” in Benton County. 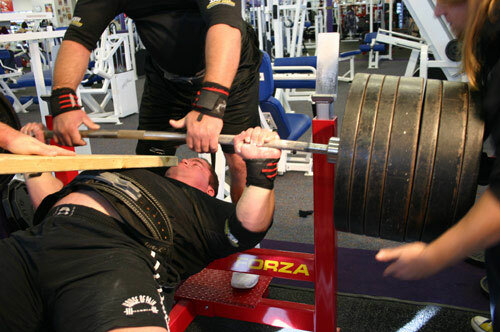 Kennelly holds the World Powerlifting Organization world record in the assisted bench press of 1075 lbs (489 kg)(“Moses Lake man’s trial in steroid shipping case delayed until April“, January 23, 2011). The October arrest originated after police received a tip about marijuana dealing in early 2010. Law enforcement was allegedly surprised to find anabolic steroids when his Lake Moses residence was raided. Kennelly purportedly distributed steroids under the underground “USA Labs” label according to ebodybuilding.info. The steroid discovery was the basis for a continuing investigation by the Grant County task force, Tri-City Metro Drug Task Force, Kennewick’s Criminal Apprehension Team and inspectors with the U.S. Postal Service. This ultimately led to a raid on a Kennewick apartment linked to Kennelly where 84 vials of anabolic steroids and several packs of “steroid chemicals” were discovered. Kennelly faces trial in Grant County on February 28th and trial in Benton County on April 18th.